Thunderbirds; The Earthquake Maker, Visitor from Space, The Antarctic Menace, Brains is Dead, The Space Cannon, The Olympic Plot, Devil’s Crag, The Eiffel Tower Demolition, The Nuclear Threat, The Hawaiian Lobster Menace, The Time Machine, The Zoo Ship, City of Doom, Chain Reaction, The Big Bang and The Mini Moon. Lady Penelope; Mr Steelman, The Isle of Arran Riddle, The Vanishing Ray and The Enemy Spy. Also featured throughout the book are several of the cutaway cross-sections produced by Graham Bleathman for the 1990s Thunderbirds comic, plus his paintings showing the launch sequences for the Thunderbirds vehicles. It’s a nice inclusion, and the introduction also does a good job of placing TV21 and the Thunderbirds strip in particular in its proper historical context within the wider world of British comics. It’s commendable that Egmont steered clear of the earliest (and thus most-often reprinted) Thunderbirds strips for this first book (perhaps due to their recent inclusion in the partwork), preferring instead to concentrate on stories that haven’t received as much exposure over the years. 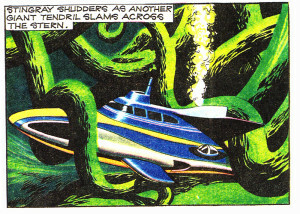 Stories like The Zoo Ship or City of Doom show that the quality of the Thunderbirds strip remained largely consistent over the years, at least while Frank Bellamy was the main illustrator, (sorry John Cooper, but everyone looks really fed up in your stories) and they deserve just as much attention as the earlier strips. 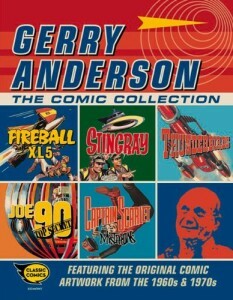 Running to nearly 300 pages this was a terrific start to Egmont’s range of reprints (and for those who couldn’t afford to put down the full £25 for it the strips in this book was also re-released as a series of five softback books) but this was only the beginning as 2014 saw the release of two Gerry Anderson titles from Egmont. Fireball XL5; The Vengeance of Saharis, Electrode 909 and The Giant Ant Invasion. Stingray; The Flying Fish Mystery, The Medallion Mystery and The Monster Weed. Lady Penelope; Behind Enemy Lines and Steelman Strikes Back. Thunderbirds; Revolt on Jupiter, Jungle Adventure, Danger in Deep and Seeking Disaster. Zero-X; Return to the Red Planet and Prisoners of the Star. Captain Scarlet; We Will Destroy Earth Communications, Secret Mission and Blue Mysteronised!. Joe 90: Collision Disaster and Mac Missing. Along for the ride as well are The Angels with the first five chapters of their strip, and all twenty-three instalments of Marina, Girl of the Sea. Also included are several features on the history of TV21, the television series it was based on and the key artists who were involved. This is easily my favourite of the Egmont titles so far due to the variety of the series featured and the inclusion of certain strips that have until now slipped the net of previous reprint volumes. Electrode 909 is a real highlight of the TV21 years and maybe possibly be the best Fireball XL5 story of all time, while the inclusion of Prisoners of the Star gives the Zero-X section a chance to show the series at its most compelling. Presenting the very first Marina storyline in its entirety was a nice touch too; I’d missed chapters of that over the years so it was great to see her full origin story included. It’s also worth noting that four of the Thunderbirds strips featured here were part of the six absent from the first volume, perhaps showing that Egmont had long term plans for this series right from the start and were intentionally holding a few back just in case. The second Egmont title of 2014, Inside the Worlds of Gerry Anderson, was a little different, collecting all the beautiful Graham Bleathman vehicle cutaways that had appeared in the pages of the Fleetway comics of the early 1990s. As a kid I adored these, removing them from the magazine and plastering them all over my bedroom wall…which is why almost none of them survive to this day, and why I utterly adore this book for giving them back to me. It’s such an obvious thing to publish that I’m amazed it’s taken this long for it to happen. Bleathman has done other Anderson cross-sections since these, but the fully painted cutaways he did in the 1990s will always be my favourites just for the sheer variety of material he covered. There’s the usual assortment of hero craft, Thunderbirds 1 and 2 and so on, but some of these get really obscure; one-off guest vehicles from the television series such as the Crablogger, the Spectrum Hovercraft or the World Army’s U87 transporter stand alongside craft and locations that only ever appeared in the pages of TV21 such as the Sea Leopard, the President ocean liner and the Atlantic Tunnel. Most of the cutaways in this volume come from Graham’s original artwork, giving them a vibrancy that might otherwise be absent if scanned from lesser sources. My only criticism of this book (and it is a tiny one) is that some of the cutaways are confined to a single (portrait) page rather than the full two-page spread; okay, extra pages would have certainly pushed the price up, but in this case I would have been happy to pay extra. Every single picture in this book is a work of art. Thunderbirds; Blazing Danger, Mission to Africa, Talons of the Eagle, The Atlantic Tunnel, Solar Danger, The Big Freeze, Operation Depthprobe, The Trapped Spy, Operation Earthquake, Tracy Island Exposed, The Revolution and The Space Mirror. all of which (with the single exception of The Space Mirror) had been only recently been reprinted in the Eaglemoss partwork, although granted that didn’t receive a nationwide release. It’s always nice to see this classic material back on the shelves, hopefully for a new audience to discover, but for longtime fans of the comics there’s nothing here we haven’t seen many many times before. As it was the fiftieth it might have been nice to shake things up a bit and include stories from across the decades; why for instance couldn’t any of the strips created for the 1990s comics be included, just for variety’s sake? Plenty of the artwork and stories there (not all, but some) are just as good as anything printed in TV21 – I would love for some of the Steve Kyte-illustrated stories to get another airing! The only genuine irritation here however is chapter five of The Big Freeze – because it isn’t there! Chapter three was reprinted in its place by mistake, and so far Egmont have remained silent on the issue of replacements or reprints. Okay, it’s only one chapter (of a story that’s been reprinted several times over the years) but it is a bit annoying nevertheless. Another more general criticism I would make of these books (with the exception of the cross-sections one) is that the artwork within is of extremely variable quality. Despite what the covers say very little (if any) original artwork seems to have been used here, and instead comes from scans of original comics. Specks of dirt and other imperfections in the image are present throughout, with The Angels strip in particular looking very grotty, and colours sometimes seem to drift a little. Stories with black-and-white artwork remain monochrome except for the two Joe 90 stories which have obviously been lifted from the 1995 Joe 90 comic, where they were colourised – passably so at the time but someone could probably do a much better job of it today. Most disappointing of all was seeing the stunning image of Captain Scarlet falling from the Eiffel Tower in Blue Mysteronised! with a lot of crease lines running across the centre of the image. If this was all that was available then fair enough but the picture quality of some of these strips is worlds away from what we saw in the Reynolds and Hearn volumes. Having said that though we’re getting more stories here than we did there so it kind of balances out, at least in my eyes. Goods; at nearly 300 pages per book the quantity of strips contained within each volume makes these excellent value for money, especially if (like me) you were able to grab Thunderbirds volume 1 for the bargaintastic price of £3 from The Works! The cross-sections volume was a wonderful surprise and may well be my favourite piece of Gerry Anderson merchandise of recent years. Bads; slightly poorer quality paper than other reprints (though understandable given the number of pages), the variable quality of the artwork, and the missing chapter of The Big Freeze. It’s too early to know yet whether 2016 will bring further releases from Egmont. 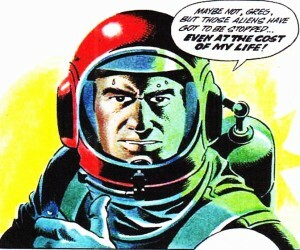 It’d be nice to think they might take a chance and do a dedicated Stingray or Captain Scarlet volume next (and considering that they’ve now exhausted all the major Thunderbirds strips they may well have to), but personally I’d love to see them go utterly mad and release a Mike Noble volume showcasing his best work on Scarlet, Fireball XL5 and Zero-X. Despite the issues I’ve mentioned with the artwork the sheer number of classic stories in these three collections make them well worth a look (at present we have about 95% of the Thunderbirds TV21 strips back in print and sitting in the nation’s bookstores – a pretty impressive achievement!) 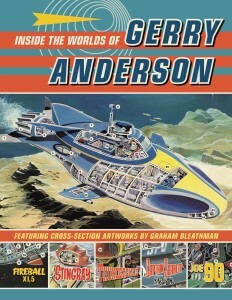 – and the cutaways book is essential for any Gerry Anderson fan. If you have a few vague memories of TV21 and just want a few stories in pristine picture quality then check out the Reynold and Hearn books, but if you’re a collector after value for money in terms of how many stories you’re getting then the Egmont reprints are the way to go. Either way you shouldn’t be disappointed! Unless you’re the Hood, of course.